I’m Charlie Nardozzi and this is the Vermont Garden Journal. Although we know it as a native in our country, the aster is a widely-grown perennial flower with a history intertwined with many cultures. It’s known as the Michaelmas daisy because its usually in full bloom on the Feast of St. Michael at the end of September. The people of Li, China were said to live well past 100 years due to drinking aster-flavored water. The Chippewa indians burned the dried aster root to attract game. Shaman’s would chew aster root to induce visions to see illnesses in patients. Most modern gardeners are more interested in the aster flowers and plant size than any folkloric uses. The two species most commonly grown in our area are the New York and New England aster. New York asters tend to grow 2 feet tall, while New England varieties grow 3 or more feet tall. New York asters also tend to be more susceptible to powdery mildew disease. Both species produce star-shaped flowers in colors such as white, pink, lavender, and red. The allure of the aster is the beautiful fall color. It blooms with goldenrods creating a perfect color combination from September until frost. They are also tough plants, surviving is USDA zone 3 and coming back consistently each year. Some good varieties to look out for are ‘Purple Dome’ with loads of lavender-colored flowers, ‘Alma Potschke’ with red flowers, and ‘Puff’, a nice white aster. 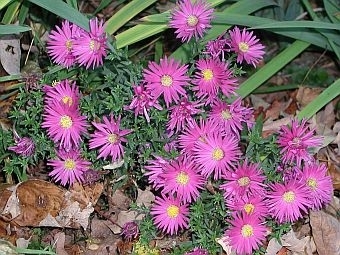 Asters grow best in full to part sun on moist, but well-drained soil. Stake tall varieties to prevent them from flopping over or pinch the tops of asters in July to stimulate a bushier, shorter plant. In spring every 3 to 4 years you may need to divide your asters if they have become large and unruly. Now for this week’s tip, harvest your gourds, pumpkins and winter squash before a frost weakens their skins. Place them in a dry, warm area to cure and toughen up, then they will be ready for storage. Next week on the Vermont Garden Journal, I’ll be talking about green shakes. For now, I’ll be seeing you in the garden! I’ve got a riddle for you. What eggs come in white, yellow, purple, red, orange and green and hail from India? It’s really not an egg. It’s the eggplant! Let’s get down and dirty about soil.